A run down on the preparations nations are making to engage in cyberwar. An introduction to the technologies, tools, and services used to counter targeted attacks. This week we learn of the massive cleanup effort that led the Defense Department to take security seriously. On August 19, 2010 Intel shocked the security world by announcing an agreement to acquire all of McAfee for $7.68 Billion. We will examine the wisdom of this move and offer suggestions on strategy to both Intel and McAfee in this breaking news webcast. 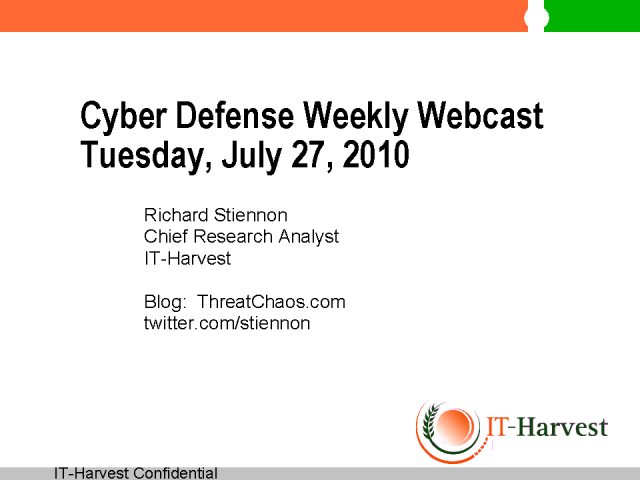 This week's Cyber Defense webcast sums up key presentations at Black Hat including thoughts on the Cold War. Industry news includes Sourcefire's Q2 earnings statement as well as the introduction of Razorback.